Do you ever notice how driven you are to be DOING something? It takes huge conscious effort on my part to just stop trying to tidy or check email or just multitask all the day long. After a while I notice that my children start to get that way, too, always needing an activity to keep them occupied. But as you may have heard before, I am a big proponent of letting kids get bored, and perhaps I should try this approach on myself as well. If I just stop and sit and stare out the window, who KNOWS what realms of creativity I might stumble into? The mind reels. In the meantime, this past weekend I was reminded of a few totally pointless activities I love to do. My older daughter and I were on our own for a few days, and I worried she might be bored without her built-in playmate/entertainer sister. We went to the beach, where she spent literally hours doing one of three things: talking to herself, jumping waves, and building sand piles. We should all do those things more often. 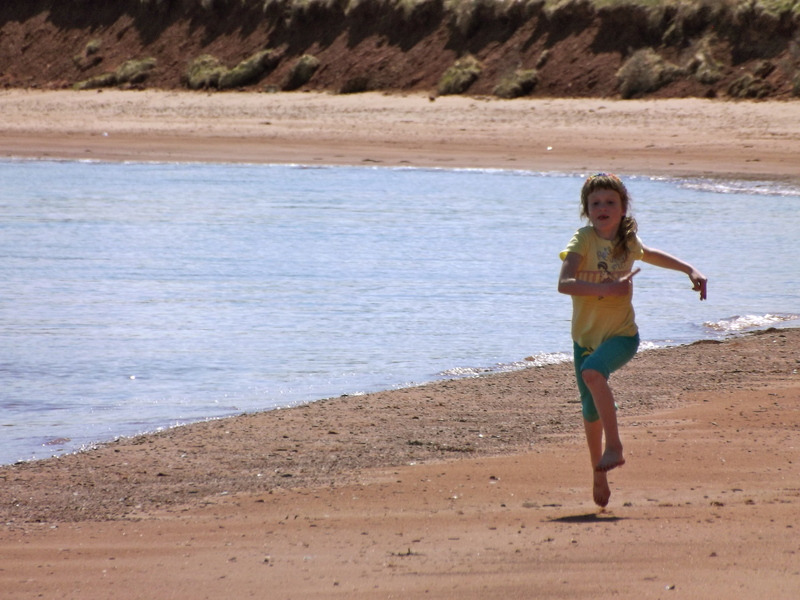 We also spent hours walking on the shore, staring down at the sand in search of treasured bits of sea glass. There is nothing more relaxing and satisfying, and really, you could almost call it a meditation of sorts. The rush of the waves in our ears, the wind in our hair, the gulls crying overhead. 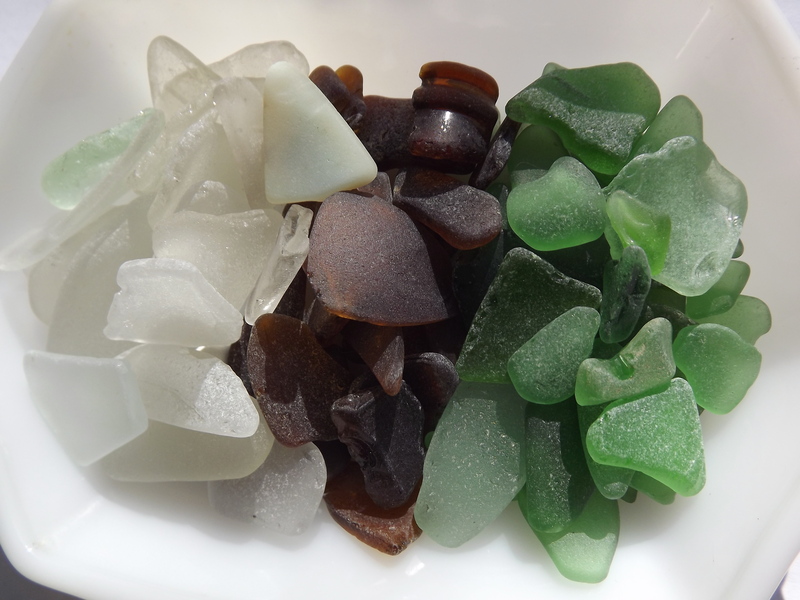 The sheer pleasure of finding the oh-so-rare colours of beach glass is just ridiculous. OK, it is not like “jumping in ecstatic joy” satisfaction, but it is quietly joyous when you find a small piece of indigo blue or jade or red. I always wonder where those shards came from…was it from a vase that sunk along with the schooner it was carried on? 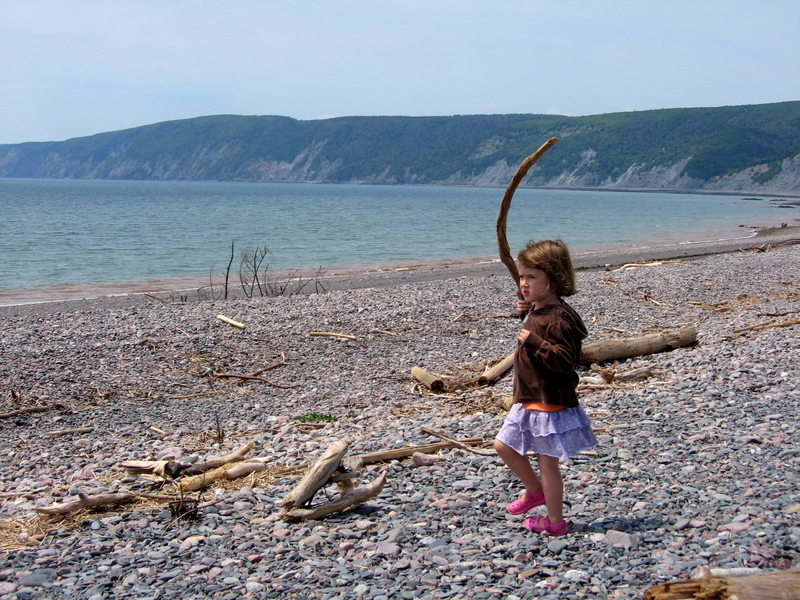 Did it come from an old pioneer dumping ground that has since eroded away with the red cliff into the sea? Was it from a broken plate tossed overboard by an irate chef as the ship sailed upstream? Well, maybe I get carried away but it is part of the whole sea glass-hunting meditation. When I find a piece, I rub it between my fingers as I continue down the shore, brushing off the grains of sand and relishing in the smooth/rough finish of the finely-sanded glass, the edges worn down to softer curves by who knows how many years of rushing salt waves and smashing rock. It is just one of those things I love. And what do we do with all these treasures? Mostly I hoard it, put in mason jars in the window and look at it when the winter winds are howling outside and I need to go to that beach-y place in my mind. Sometimes we twist it in silver and make it into jewellery, which by far gets more comments from strangers than any store-bought trinkets ever do. There is something about old stuff that speaks to me, even if I know nothing about it. Deep down I know I have just as many shards of 1980s Sprite and Mountain Dew bottles (not to mention the brown of the classic stubby beer bottle) as I do of some long-adrift century-old crockery, but it doesn’t matter. The cobalt blue probably comes from plain old Noxema jars that we all had in the 70s and 80s but in the process of being sea-tossed and sanded to silky smoothness, it takes on a unique patina of beauty and sophistication. And who doesn’t want to wear that? Anyhow, that was my mindfulness activity this glorious Victoria Day weekend. The glass is scattered on my counter, having been rinsed and set out to dry. The girls will love to sort it by colour and shape into jars, another wonderfully senseless and strangely soothing action. I will keep adding to the collection, while silently cursing Noxema for switching to boring cobalt plastic jars. I feel fairly sure they will never be a treasure tossed, shaped and finally relinquished by the seas. Oh well, such is the modern age. Beauitiful! I was just talking and writing about sea glass!! So true again Steph! Love that feeling of wondering where it came from and thanks for reminding me that it’s ok to actually relax and not have to “do” something!